Reese’s Stuffed Peanut Butter Cookies that are dipped in chocolate and sprinkled with peanuts are the only cookies I need in my life. They are giant cookies, fully loaded with peanut butter, and have a full-size Reese’s cup in the center. What’s not to love? If you’ve been around awhile, you know that I’m a sucker for peanut butter. Add chocolate to the mix and I can’t resist. Most people can’t resist chocolate and peanut butter except my husband’s father and my hairdresser. I took a couple cookies up to my sweet, sweet hair lady and she shut me down. I just didn’t want to grasp the idea of someone not being madly in love with peanut butter. 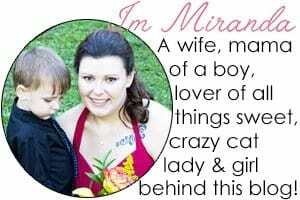 She’s missing out on so much. Peanut butter pie, cookies, FROSTING!! I finished the Reese’s stuffed cookies a couple of ways. I dipped them in chocolate and sprinkled chopped peanuts on top for some. Then I drizzled chocolate on top of others. Why did I do this? I asked for my husband’s opinion on which I should do knowing that I wanted to dip them and he insisted on a drizzle looking better. Can I use mini Reese’s peanut butter cups? Yes! If you’re using smaller peanut butter cups, feel free to make your cookies smaller too. If I make smaller cookies, how long should I bake them for? I would use a 1 1/2 tablespoon scoop and start checking the cookies at 8 minutes. You’re watching for the sides to slightly brown up. Do I have to stuff the cookies with Reese’s peanut butter cups? No! You can substitute the Reese’s for chocolate bars or other candy or leave it out all together. It’s up to you. 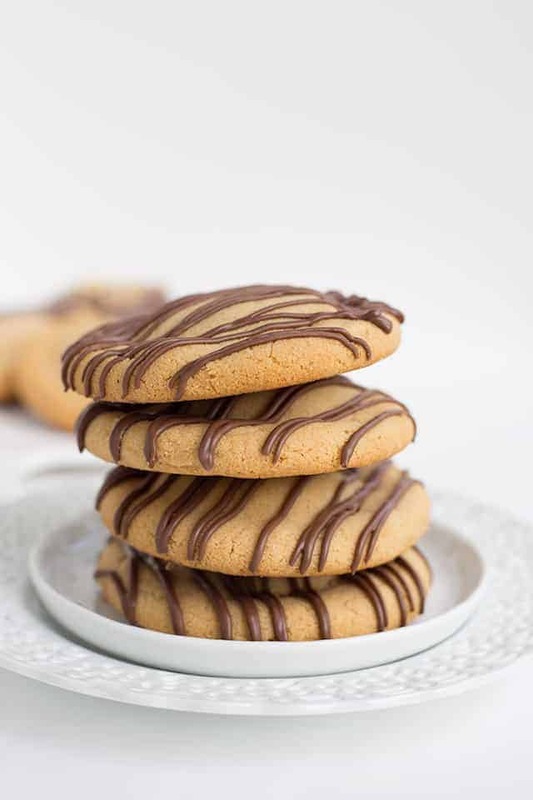 Can I use chocolate chips instead of candy melts to dip/drizzle on my peanut butter cookies? Yes. Heat the chocolate chips the same way you heat up the candy melts. The chocolate chips will take longer to set up than the candy melts. What size cookie scoop did you use? I used the 3 tablespoon OXO cookie scoop. 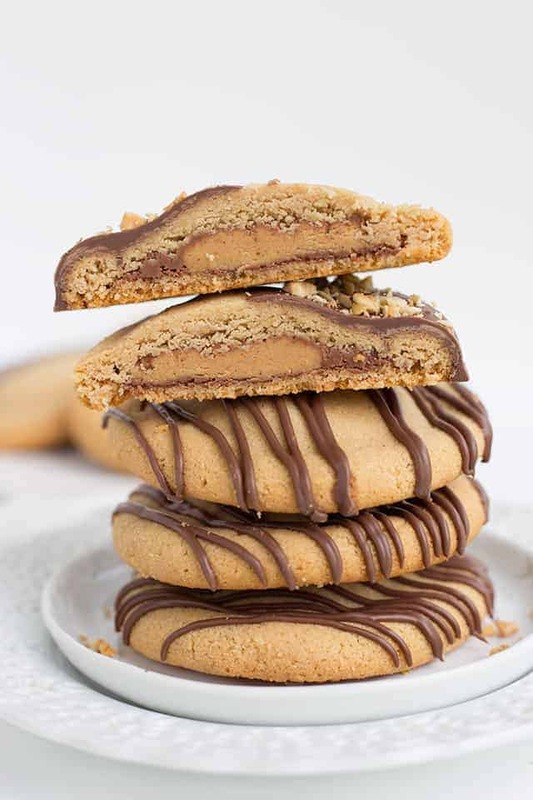 Cookie Variation Tip: Add the white chocolate peanut butter cup in the center and dip or drizzle the peanut butter cookie in a white chocolate. 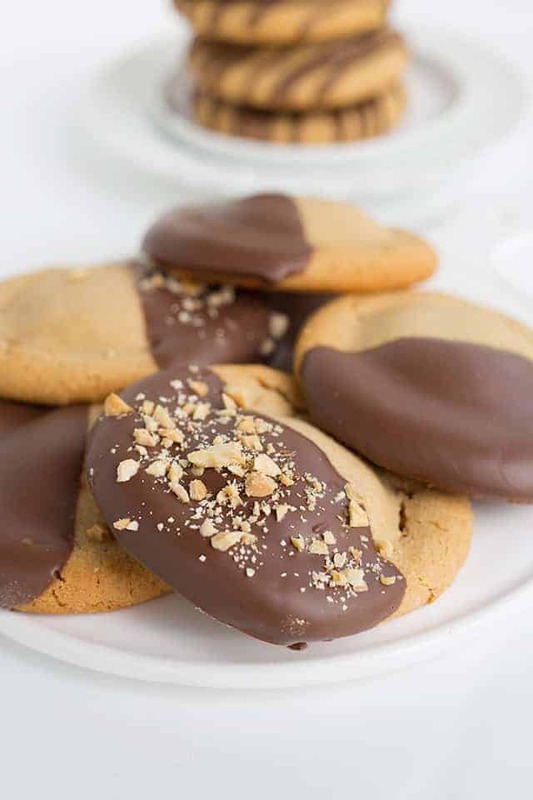 These over-the-top Reese's Stuffed Peanut Butter Cookies that are dipped in chocolate and sprinkled with peanuts. They are giant peanut butter cookies, fully loaded with peanut butter, and have a full-size Reese's cup in the center. In a large mixing bowl, add butter and peanut butter. Beat on medium with a hand mixer until smooth and creamy. Add the brown sugar and granulated sugar. Beat until incorporated. Add the egg and vanilla extract. Continue to beat on medium until the egg is combined. Add in the flour, baking soda, and salt. Beat on low until most of the flour is worked in. Turn hand mixer up to medium and finish working in the flour. Using a 3 tablespoon scoop, scoop the cookie dough into your hand. Flatten it out and place a peanut butter cup in the center. Work the dough around the peanut butter cup and pinch together any cracks or holes. Place onto the prepared cookie sheet. Leave about 2 inches of space between each cookie. Place in the preheated oven for 16 minutes or until the edges are slightly brown. Let cool on the cookie sheet for about 10 minutes and place on a cooling rack to cool completely. Add the candy melts into a microwave-safe bowl. Microwave for 30 seconds and stir. Repeat microwaving and stirring until the chocolate is completely melted and smooth. 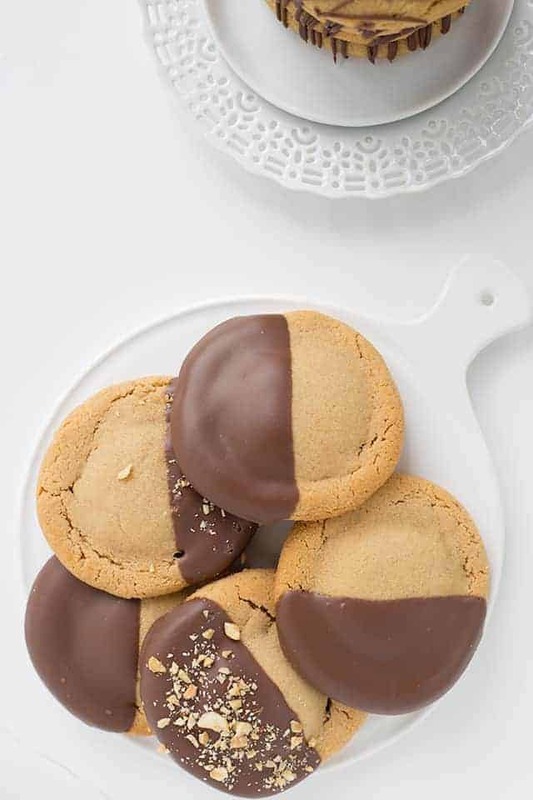 Dipped Cookies: Dip the completely cooled cookies into the chocolate. Scrape off the excess chocolate on the bottom of the cookie. Sprinkle with chopped peanuts as soon as you place it on the wax paper. Drizzled cookies: You'll probably only need 1/2 cup of candy melts rather than 1 cup. Pour the melted chocolate into a sandwich bag or a disposable piping bag. Cut a small hole in the corner of the sandwich bag or in the tip of the piping bag. Lay the completely cooled cookie on a piece of wax paper. 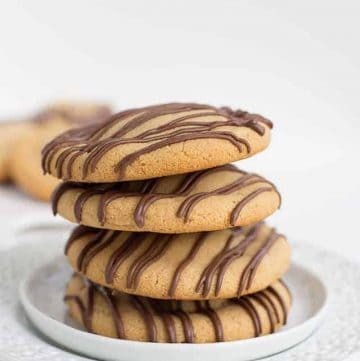 Drizzle the chocolate back and forth on cookie. Let the chocolate set. These are just gorgeous! Peanut butter cookies are my fav! This is a TASTE OF HOME RECIPE!?!?!? I just made these cookies this afternoon. They are wonderful! ..grin.. I rolled the dough in powdered sugar first and it helped to flatten out without sticking to your hands. I went 10 minutes with mine as I used the mini peanut butter cups.